Football Rutgers vs Princeton Themed Combo 4n1 Standard - For the size of a normal jump house you can have it all! Do more than jump. This awesome 4 in 1 unit gives you plenty of jumping, basket ball hoop, 'rock wall' climb and an amazing fast slide all inside a unit the size of a standard 15'x15' bounce house! . In the bounce, they can jump or shoot hoops. The bounce area is 115 square feet so there’s plenty of room for fun. But there is more. . . the fun doesn’t stop! Kids will love 'rock' climbing up to the top of our 13’ Slide. Then they will experience the tallest Combo Slide in the Industry, with a 50 degree sliding angle! What a thrill! What a rush! 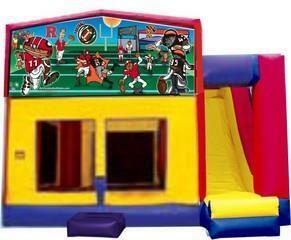 Football Rutgers vs PrincetonThemed Combo 4n1 Standard - For the size of a normal jump house you can have it all! Do more than jump. This awesome 4 in 1 unit gives you plenty of jumping, basket ball hoop, 'rock wall' climb and an amazing fast slide all inside a unit the size of a standard 15'x15' bounce house! . In the bounce, they can jump or shoot hoops. The bounce area is 115 square feet so there’s plenty of room for fun. But there is more. . . the fun doesn’t stop! Kids will love 'rock' climbing up to the top of our 13’ Slide. Then they will experience the tallest Combo Slide in the Industry, with a 50 degree sliding angle! What a thrill! What a rush! Slide is completely enclosed for safety. Combo needs a 18’ x 18’ area for set up. Recommended for children 5 to 10 years of age. Children must be at least 42' tall to enter and 12 years of age or under. A maximum of 8 children may play at one time. Air Castle inflatables are not designed to handle adults. This complete unit rents for a full day! While others get just a bounce house you can get the upgrade for your party - a 'rock wall' climb, slide and basket ball hoop!! Available in all themes, ask for details!